Sh.Ramesh Bidhuri was born in a respectable family in the historical village of Tughlakabad located in South Delhi. Currently, he is serving as Mp from South Delhi and has been former MLA for three consecutive terms. Sh. Bidhuri and members of his family have been active members of the Rashtriya Swayam Sewak Sangh from their early childhood. Sh. Bidhuri started his political career as a student when he was elected as the central councilor of Saheed Bhagat Singh College and to the executive council of Delhi University. As a student leader he worked diligently and dedicatedly for ABVP since 1983. Sh. Bidhuri completed his graduation in B.Com. from Saheed Bhagat Singh College(M), Delhi University and completed his degree in LAW (LLB) from Ch. Charan Singh University, Meerut and is now Advocate in Delhi High Court. Sh. Bidhuri possesses a strong desire of serving the community. He has inherited this sense of service from his ancestors who have contributed a lot to the society. His father late Shri Ramrikh was a dedicated social worker, his grandfather donated a large portion of his ancestral property for the construction of an Arya Samaj Mandir, a school and a hospital in Tughlakabad village. Several children and sick are being benefitted from the goverment school and the hospital constructed on the donated land. While he was a legislator, Sh. Bidhuri devoted much of his time working for public. He is a very religious man by nature and believes in doing a lot of religious work. As an active member of BJP he is always available to listen and address the grievances of the people of the area. It is for these reasons that the people of Tughlakabad constituency elected him their legislator first time in the year 2003. After delimitation in 2008, the constituency of Tughlakabad was divided into two and Okhla became a part of Tughlakabad constituency. For the first time in 65 years, the people of Okhla elected a BJP candidate, Sh. Bidhuri Ji. Based on his dedication to the constituency, the residents of Tughlakabad give the third consecutive term to Sh. Bidhuri Ji in 2013. Within a year of becoming a legislator Sh. Bidhuri did several notable works in his area. In spite of his constituency’s major area being unauthorised, he undertook electrification of the area, opened new high schools, got new baarat ghars constructed, got new 100 bed Hospital(Jachha Bachha Hospital) and Baarat Ghar constructed in Kalka Ji Extn., got new drainage systems laid and roads constructed. He also obtained an approval of `20 crore for underground reservoir and laying pipe lines for water in the area, he undertook the beautification of Parks, Cremation Grounds. Contribution in the development of the Okhla Phase-I & II: improvement in road conditions, construction of Baarat Ghar, problem of Water etc. have been solved. Now, in order to strengthen the nationalistic forces and for the service of the society the BJP leadership has nominated him as a candidate for the South Delhi Lok Sabha seat. He is well aware of the problems that the people of South Delhi are facing. Problems such as lack of Hospitals/Health centers for poor people, education of children failure of opening any college in the area during the last 30 years, lack of Overbridges on Railway lines, Play Grounds & Sports Complexes for children, problem of drinking water in Palam, Brijwasan, Mehrauli, Ambedkar Nagar, Sangam Vihar, Devli, Kalkaji and Tughlakabad assembly constituencies. People of the area are waiting for the last 20 years for the work to be done and now Sh. 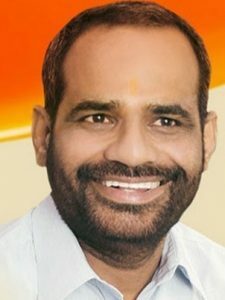 Ramesh Bidhuri ji will work for development and finding solutions to all their problems.